With Remembrance Day having just passed, I thought it would be a good time to talk about this. I don’t wear a poppy. I put my quarter in, but I don’t take one. Sometimes people bring them to me, and I thank them, but I don’t put it on. It’s not a method of protest, and it’s not because they don’t go with my eyes, but because not wearing a poppy helps me remember. Let me explain. We all know why the poppies are there. They grow in Flanders Fields, where many of the soldiers of WWI are buried. We wear them to commemorate the fact that they laid down their lives in order to preserve our way of life, and to show support for the current members of the armed services. You learn that when you’re a kid, and you know that when November comes, you put on your little plastic poppy to show it. It’s a sight to see, all those people gathered at the cenotaph for the 11th hour, row on row of poppies. But by the next day, they’re gone. They’ve got other things to do, they’re living the lives those sacrifices earned them, and I’m not about to criticize that. We can’t spend all our time mourning our dead. Now, if you agree with the sentiments of poppy-wearing, then it seems like what’s really important is remembering and appreciating those in the armed services who have guarded our way of life in the past and those who do so in the present. 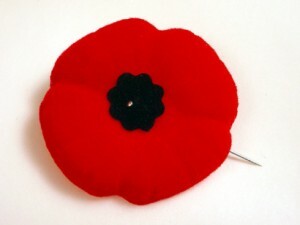 The poppy is a way of showing that, but if it’s the sentiment that’s important, I can do that without wearing a poppy. Furthermore, I can do it better without wearing a poppy, because other people will hold me accountable for doing it. The conversation I have most often in November begins with “Hey, you lost your poppy.” And this is great. Not only does it mean that they’re assuming I’m taking some kind of positive action, but it creates an opportunity for us to talk about why we remember in the ways that we do. For ten minutes we’re talking about why we value the kinds of things the armed forces do for us and have done for us in the past. Sometimes they have a story about a friend or family member in the service, or how they themselves served. Other times it’s in the abstract, about the risks our troops and their support staff are taking in Afghanistan right now. For ten minutes, we’re not just wearing our remembrance, we’re living it. I have that conversation a lot, and I’d never get to hear those stories and those reasons if I wore a poppy, because we’d just nod and go our separate ways. I’m not saying you shouldn’t wear a poppy, just that you should find your own way of showing your appreciation for our armed forces and do that. Mine involves not wearing a poppy, because that’s what invites people to talk with me and express their feelings about the occasion. Other things might include laying flowers or the like at your local memorial, or going down to your local reserve unit on drill night and buying them coffee. Write a letter to a soldier serving overseas, or go out and stand at the memorial for twenty minutes, and keep your own vigil. The best part about these kinds of things is that they don’t have to happen in November. We can do them all year round, and we should, because they’re working for us all year round. So if you see someone not wearing a poppy, go and ask them about it. One of them is me, and I want you to remember with me.